We can all relate to that feeling of home; it’s defined by the comfort that comes with a personal touch. However, with homes built to last and tastes and trends constantly on the move, you could find that the world has moved on since your home was first built. The Endurance range of composite doors offers a wide selection of beautiful styles to choose from, comprising a door design that looks, feels and sounds like the market-leading do or that it is. You’ll be able to choose from a wide range of accessories and colours to capture your perfect look. This is important because homes can come in a range of variations, which are then thrown into the melting pot of personal tastes. With the Endurance range, you’ll get the freedom to bring the ideal new fit to your home without having to worry about your home being old or new. Plants have proven themselves to be a beautiful, natural way for you to bring something refreshing to your home. 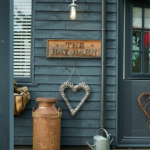 From brightly coloured flowers to the timeless appeal of leafy greens, plants are sure to be a welcoming new addition to the front of your home. Not only do plants help the feel of your room, they also help to keep things moving across the year, so you don’t stagnate on a single look. As plants change and grow across the months, you’ll be less likely to get bogged down in the same old same old. Setting the tone of your home is made easy with a choice of lighting options. Not only does outdoor lighting illuminate the way to your home, but it also allows you to add elegance and kerb appeal to your property. A popular option is to have parallel lighting running alongside your walkway, or you can place soft lighting on or near your plants/trees to help show them off during the night time. You can also opt for coloured lighting, or lighting that changes on a timer: the choice is seemingly endless. As a practical way to add style to the entrance of your home, door mats are a wonderful way to bring a unique feature to your property. With so many options available, including novelty options, it’s never been easier to bring something personal to the front of your home. One way to do this is to layer different sized door mats to create a unique style, such as placing a large geometric mat under a small one to add something different to your home. You can also mix and match colouring across the year to help keep things fresh. Wreaths allow you to bring a dynamic decoration to your home, that can offer an aesthetic that changes with the seasons. They are perfect for expressing your own style, love of colour and bring a certain charm to your property that is sure to appeal. Whether you choose a wreath that represents a month (like a beautiful auburn Autumn feel) or one that represents a holiday (Christmas? Or Easter?) you’ll be able to complement your door at the same time. It’s a fantastic way to create a feel of seasonal cheer that suits your home.